After spending a long 34 years in space and a total of 20 billion miles, Voyager 1 and Voyager 2 are set for their greatest adventure to date. The two Voyager spacecrafts launched in 1977. They had a big mission: Fly to Jupiter, then on to Saturn and then maybe swing by Uranus and Neptune. Voyager 2 made that grand tour. It flew through the solar system. In 1989, it visited Neptune. 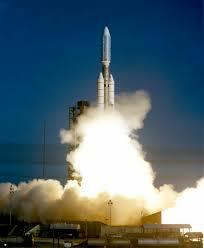 It is still the only spacecraft to have visited the outer planets of Uranus and Neptune. Voyager 1 visited Jupiter and Saturn. It spun past Saturn’s moon Titan. Then the craft traveled toward the edge of the solar system. The Voyagers were more successful than anyone had expected. And they continue to soar through space. Now, the Voyagers are set to leave the solar system. What will they find? Leave us your comments. Your feedback is greatly appreciated. Let us know what other topics you would like to have discussed. Share this post with your friends. Keep on learning kids.